With so many websites that people can make purchases from, and how many horror stories there are about people purchasing from a website that lacks any level of professional integrity, people are becoming very careful in regard to what businesses they will trust enough to give their information to, let alone make a purchase from. With this in mind, it makes sense that along with marketing and advertising that your business also focus on building brand trust in order to assure potential customers that you are a legitimate and professional business, worthy of handling the trust that is given along with any purchase. 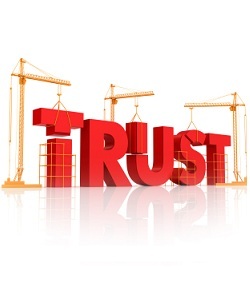 There are a number of ways to develop trust before someone purchases from your website. Activities such as joining the Better Business Bureau is one way to earn trust because people know when they see the BBB badge on your site that it has gone through the requirements in order to be eligible to earn that badge. It also allows potential customers to know that they have recourse if they have a bad experience with your website due to the Better Business Bureau’s ongoing scrutiny of businesses that are associated with them. If your business or products have been featured on well known websites, trust in your brand is created through social proof. People feel more positive about doing business with a company that is acknowledged with positive feedback from popular websites or other brands that they all ready trust. If you have more than one way of offering this sort of social proof creating a “Featured In” or “As Seen In” page on your site is a helpful way of allowing people to see who has positive things to say about your business. Including staff photos and talking about staff news, such as “Employee of the Month” information, or congratulating staff members for important milestones is another great way to help build brand trust because when people are able to put a name and face together, they feel a greater sense of familiarity. When potential customers feel like they “know” you, or someone on your staff, they will naturally feel more comfortable with making purchases. Of course, this plays into developing a presence on social media sites and engaging with people on a more personal level because this is another powerful way to help people feel like they “know” you and your staff members. Along with joining professional associations such as the Better Business Bureau, announcing other positive associations and getting personal with staff photos and information on your site and social media profiles, clearly displaying contact information, including a phone number can significantly increase brand trust. Many times when people know they can call and talk to a real person that is the assurance they need to go ahead with their purchase. Focusing on building brand trust in these ways along with social media marketing and advertising campaigns is sure to increase your business profits.